This year will see REHAU exhibiting at Specifi, the UK’s only built environment roadshow, for the first time, where two new products will be showcased. The Specifi events take place nationwide, with Edinburgh being the first port of call for REHAU at the Assembly Rooms on March 28th. REHAU’s RAUTITAN plumbing system will be exhibited; this is the 10 bar pipework solution designed for drinking water and heating systems, launched at the end of last year. 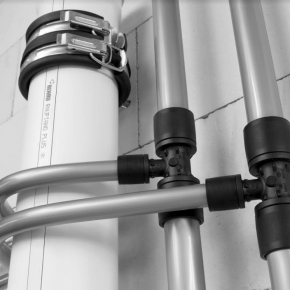 The flexible PE-Xa RAUTITAN pipework system delivers on durability, corrosion resistance and ease of installation; certified as hygienic for drinking water, its smooth surface stops deposits forming, while cavity-free impermeable joints eradicate any risk of microbial contamination. RAUTITAN can be used for radiator connections and for installations through the floor, skirting board or wall. The new sound attenuated drainage solution, RAUPIANO, will also be showcased by the REHAU ream, set to be released to the market later in 2018. The RAUPIANO product’s benefits include a patented structure, plus being sound damping, heat and impact resistant, chemical resistant and pressure resistant to 2-bar. Drew Clough, Product Manager at REHAU, said they would be looking forward to be attending Specifi for the first time. “Our first stop is Edinburgh, but we will also be attending Glasgow, Manchester, Newcastle and London. So if you can’t make the first event we hope to see you at one of the following Specifi events,” he said.